Maple Spiced Chia Overnight Oats are the perfect make-ahead breakfast. Filling, creamy and delicious, make some up before you go to bed and you have the perfect grab-and-go breakfast for those busy mornings. They make the perfect meal to enjoy on a road-trip on when you get to work. Mason jars filled with Maple Spiced Chia Overnight Oats have become a favorite road-trip breakfast in our family. I originally whipped up a batch when we went on a little jaunt to San Francisco with mum, and they have been requested so many times since, that I just had to share. I was just about to head to bed for the night so I could get up bright and early for a family trip to SF the next day. I took 5 minutes before hitting the hay and whipped up a couple of jars of chia overnight oats so we didn’t have to eat out for every. single. meal. As much as I love eating out, I always tend to feel gross and greedy if we do it for every meal. Especially taking into account the greasy breakfasts that tend to be available while on the road. 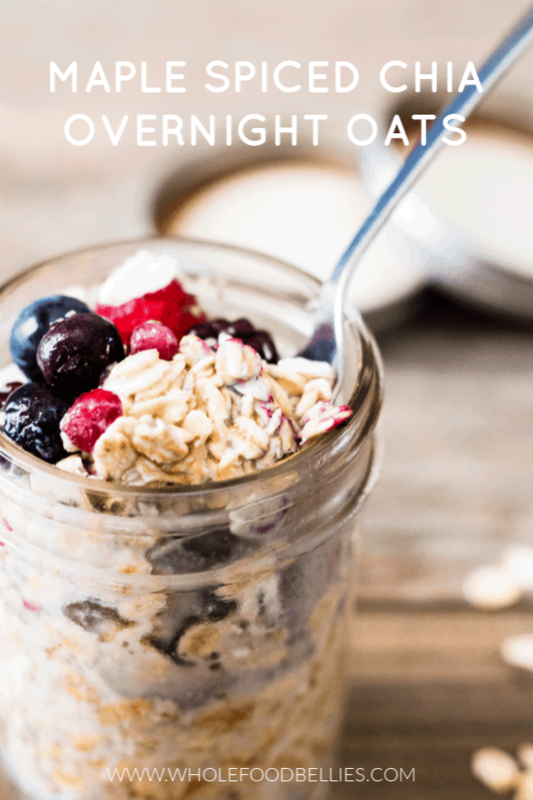 Overnight oats make it so easy to put together a make-ahead breakfast! What Ingredients Are Needed For Chia Overnight Oats? Pop everything except the fruit into a mason jar with a lid, give it a good stir, top with frozen fruit and pop into the fridge. Just grab on the way out the door in the morning and Bob’s your uncle. In the mornings let them go to the fridge and get out their own little jar. I can guarantee they are more likely to gobble up every last bite if they had a hand in the process! Do yourself a favor and add this great make-ahead breakfast to your next meal prep Sunday. They will make breakfast a breeze and keep little bellies full for longer. And don’t forget the mason jars, they are a must for the cuteness factor alone. I love to hear from you, so be sure to pop back and leave a comment once you try them out, or pin to your breakfast board for later. Happy eating! I have included enough ingredients for just one serving, if you want more, just add the same amount to each mason jar. Keeps well in the fridge for a couple of days. I have never made overnight oats before but these sound great! Hope you’re enjoying the month with your mom and had a good time on your 2 nights away from the kids! I need this to…be my breakfast!! I love overnight oats to no end. The ingredients in this one is different from any that I have had. Thanks so much and I am going to really enjoy it. We love them too Ginny, so yummy, and it is really nice to have breakfast all prepared for the morning! These are just darling! I haven’t made overnight cold oats in ages, and your recipe makes me think it’s time to change that. I hope you do Mary 🙂 We love them! How delicious these look! – what a perfect way to start the day. Love the make ahead too, this will make my week so much easier! Overnight oats are just the best! I love that you can just throw it all together the night before and wake up to a ready made breakfast sitting in the fridge! Sounds like such a hearty and EASY breakfast!! Yum! Overnight oats are perfect for a delicious and quick breakfast. I love all of the ingredients in this recipe. Enjoy your weekend away! We did thanks, it was lovely 🙂 They are definitely handy for a quick and easy breakfast! I do make a chia seeds breakfast bowl without oats. I am going to start adding oats too in my breakfast bowl. :). thanks for sharing. We do a lot of overnight oats over here! I love maple in them so this sound delicious! Chia seeds are a must in overnight oats! Extra creamy goodness!